The shooting at South Carolina State University has turned fatal, sadly. The shooting happened at about 1:30pm this afternoon. The shooting was outside the Andrew Hugine Dorms at the Orangeburg college. There are four suspects in the shooting. 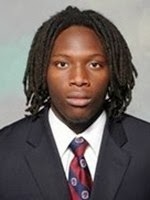 The person killed was South Carolina State defensive lineman Brandon Robinson. Robinson was a defensive end on the South Carolina State football team. Brandon Robinson played for Orangeburg-Wilkinson High School in Orangeburg. Robinson was a redshirt junior on the team, and played in nine games this year. He had five tackles on the year. He also played in three games in 2012. Robinson was an industrial engineering technology major on campus. In high school, Robinson was named to All-Area in football by the Times and Democrat newspaper, and was also named player of the week by the Orangeburg Touchdown Club. Robinson was the 9th ranked wrestler in the state in his weight class (215 pounds) in high school. Prayers to South Carolina State University, the South Carolina State football family, and everyone affected by this shooting.